Demand response (DR) once represented a fundamentally new way of keeping the utility grid in balance. Instead of turning on rarely used expensive and often polluting peaker plants to meet spikes in electricity demand, one can instead dial back demand . Under this DR approach to managing the larger grid, utilities and transmission grid operators can tap their commercial, industrial and residential energy consumers to proactively manage on-site demand and back-up power supplies to maintain grid reliability while also reducing on-site energy costs. Today, new DR technologies can change the energy consumption patterns of end-use customers in near real-time to respond to price signals or other alerts issued by utilities and grid operators. 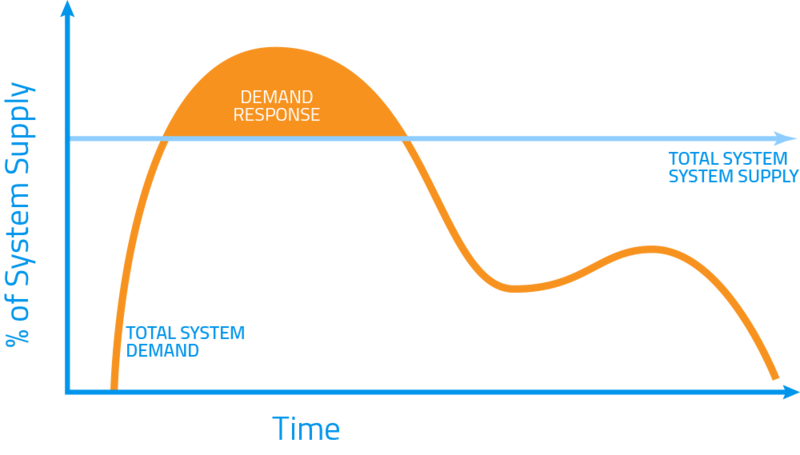 The reason these programs are called “demand response” is that they occur in response to a request to throttle back consumption based on changes in the price of electricity or at times when wholesale market prices are high or system reliability is jeopardized. DR is another way on-site DER can add bi-directional value to both the larger grid and energy consumers alike. Typical energy savings range from 15 to 30 percent annually, netting potentially millions of dollars to program participants. Approximately 10 percent of U.S. electric system capacity is built to meet peak demand conditions that arise in just 1 percent of the hours in any given year. DR enables grid operators and electric utilities to relieve stress on the electrical grid at a lower cost, freeing up capital and increasing the overall efficiency of the entire grid network. During peak power events, the electric grid is at risk for blackouts, which result in the need to bring some of the oldest (and least environmentally-friendly) power plants back online. By shedding loads during peak periods and keeping the grid stable, DR can provide environment benefits and moderate demand in near real-time. Old-school DR has been difficult to scale-up in a cost-effective manner because many programs involve inefficient manual processes that limited overall value. The industry is therefore shifting to an automated approach. Encorp leverages a complementary mix of hardware and software to deliver a fully integrated and automated real-time DR solution. At the heart of Encorp’s approach to DR is Encorp’s Egility, which provides control, communication and grid interconnection capabilities for on-site generators. During peak periods, as the demand for power within a facility increases, the price charged by the utility also increases. In order to avoid excessive utility charges, Encorp’sEgiilty can be used to monitor the utility, dial-back demand or automatically start generators, and perform a power transfer whenever necessary. The Egility can also be used to auto-schedule either load reductions or your generator based on pre-defined preferences. DR programs are becoming increasingly prevalent across the country as utilities deal with growing electricity demand, limited power generation options and an aging power grid. A recent Supreme Court ruling that allows the Federal Energy Regulatory Commission (FERC) to regulate the sale of electric energy at wholesale in interstate commerce, is also expected to fuel faster growth in DR programs across wholesale electricity markets, which cover approximately 60 percent of U.S. power supply. Since our inception in 1992, Encorp has played a prominent role in the DR space. We have served on the Institute of Electrical Energy Engineers (IEEE) 1547 committee, the group responsible for establishing the criteria and requirements for the interconnection of DER with electric power systems in the U.S. We have completed DR projects with industry stars including Maui Pineapple, Kmart, Northeast Foods, and more. Encorp has also worked with the largest DR aggregators like EnerNOC, now part of Enel, an Italian utility, as well as the most reputable energy manufacturers across the globe. We’d like to work with you too. Learn more about our most successful projects now.